With three Gameweeks in eight days, rotation will be on the top of every S11 manager’s mind. You’ll want to keep a keen eye on the lineups when they drop and use your three subs wisely. The weekend’s focus will be on the Arsenal - Manchester United clash, but with the potential of a Mourinho-led stalemate, you may want to watch it closely and make early substitutes based on momentum instead of building your team around it. 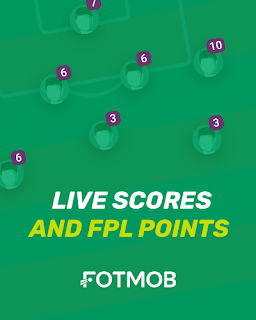 If you’d like to get involved this week by challenging us, simply create your lineups for Gameweek 15 today via the FREE Apple or Android apps. 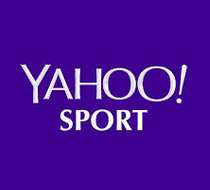 Mo Salah was rested until the 67th minute on Wednesday and promptly scored two goals in his brief cameo. He’s now on 12 goals in 14 gameweeks and is safely a must-pick every week. He’s visiting Brighton, which isn’t an easy fixture, but is there a fixture in the world Salah couldn’t score in at the moment? You may be chasing goals with a Wayne Rooney pick, but after a midweek hattrick, he’s worth a consideration as a differential. With the ability to pick a new lineup every week, there’s less punishment for going after form players that may be risky. Everton are at home against Huddersfield for what will be Big Sam’s first match in charge. The Belgian has two goals and two assists in the last three gameweeks as Chelsea have moved into third. He came off the bench in the 81st minute against Swansea midweek, so should be well-rested to face Newcastle. The Magpies have allowed 19 goals this season and have only one away win in seven tries so far. Mahrez’s goal against Spurs was an absolutely gorgeous strike, reminiscent of numerous goals from the Foxes’ title-winning season. He’s on 3 goals and 6 assists through 14 Gameweeks with Jamie Vardy finding the back of the net midweek as well. Leicester will be up against Burnley at home, against whom the Algerian’s ability to unlock stingy defenses should be key. With Chelsea at home against Newcastle, who average less than a goal a game, Azpilicueta is a good bet for a clean sheet and some points at the other end as well. Like Hazard, he was rested against Swans. Azpilicueta averaged 20 points in his three previous matches in S11, making him one of the most in-form players at the moment. Yes, I can’t believe it either. An Everton defender? The Toffees managed a clean sheet against West Ham at home and will now be taking on Huddersfield at Goodison Park. The visitors have only scored nine goals all year, so there’s a decent chance Everton could get a second clean sheet in a row. If you decide to take the risk, be sure to have a sub handy in case things start looking shaky for the Toffees. Doubling up on Chelsea at the back is a solid strategy with another home match against a side that isn’t exactly prolific. The Belgian keeper has kept a clean sheet in half of his matches so far this season. Swansea are away to Stoke, which feels like it has 0-0 written all over it. Not many managers are going to take a punt on a keeper headed away, but Fabianski has been one of S11’s most consistent performers between the posts. Mo Salah, Mo Salah, Mo Salah. At this point, why would you choose anyone else? Whatever you decide, I hope you’ll join us in Gameweek 15 by downloading the FREE Starting 11 app in the App Store or the Google Play Store. 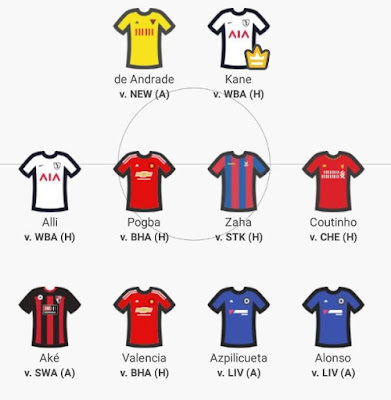 If you’d like to get involved this week by challenging us, simply create your lineups for Gameweek 12 today via the FREE Apple or Android apps. Don't be disheartened by his inability to score in Gameweek 12. He's due. West Brom in their vulnerable state will be a good opportunity for him to score in the Premier League again. He's been a sensation for Watford this season. I dub him the 'new Michu'. He is more than capable of attaining returns against a Newcastle team that is lacking form and confidence. The England international's form as a whole hasn't been great since August. I just think that with the law of averages he is more than capable of scoring against the Baggies, just like Harry Kane. Manchester United missed his presence. Whenever he has started this season his influence has been paramount. I expect Paul Pogba to step up to the plate again this weekend. If Crytal Palace will avoid relegation this season it will most likely be due to their Ivory Coast international. He seems unstoppable at the moment. His supposed summer transfer saga is history for the time being. He has rediscovered his attacking touch and is an asset to Liverpool. There was a period last season in which he seemed to be scoring for fun. Now that Bournemouth have rediscovered their confidence he could produce more than a clean sheet. He has been one of United's most consistent and ever present defenders this season. He's racking up clean sheets for fun and has the real potential of providing assists. The Brazil international has been one of Chelsea's best performing defenders this season. His attacking returns haven't gone unnoticed. He has effectivey been deployed as midfielder since last season. His goal against West Brom served as reminder of his scoring capabilities. 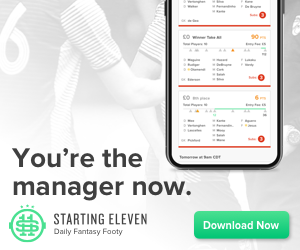 Whatever you decide, I hope you’ll join me in Gameweek 13 by downloading the FREE Starting 11 app in the App Store or the Google Play Store.